Ensconced in the heart of the Amazon Rainforest, the world’s largest outdoor iron mine has not created the expected amount wealth or quality of life. While the trail of destruction continues to grow around it, the company that owns the mining rights contributes towards research of endemic species in the region. Are the days of the Yasuní numbered? The Ecuadorian government stirred up a great deal of expectation with the announcement of a financial compensation system in exchange for environmental services. But has presidente Rafael Correa changed his mind? There is a platform that intends to integrate systems of traceability in Brazilian red meat, revealing with genetic precision if the meat on the store shelf is a result of environmental crimes. Guyana has for decades attracted locals and foreigners to its vast forested interior in the hunt for gold and diamond. The only problem with that is that they have been destroying the Amazon forest in the process. More than just the end of a tradition, the decline of rubber extraction represents the collapse of the model envisioned by Brazil of defending the possibility of preserving the forest while affording respectable living conditions for those who inhabit it. With international support, the country attempts to define the most convenient mechanisms to quantify deforestation and carbon stocks. Meet the enormous species found in the Amazon. Test your knowledge of the world’s largest rain forest. 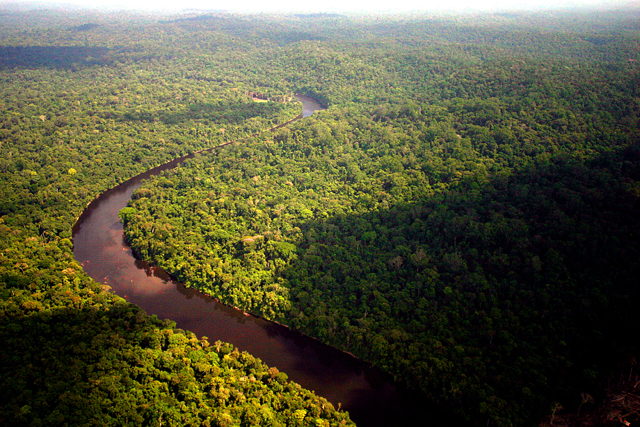 Do you have news to share from the Amazon? Contribute to this map by submitting your story. Create a custom map visualization with different news and spread the word. Download all the researched data used to design our maps and help us remix it into new visualizations.